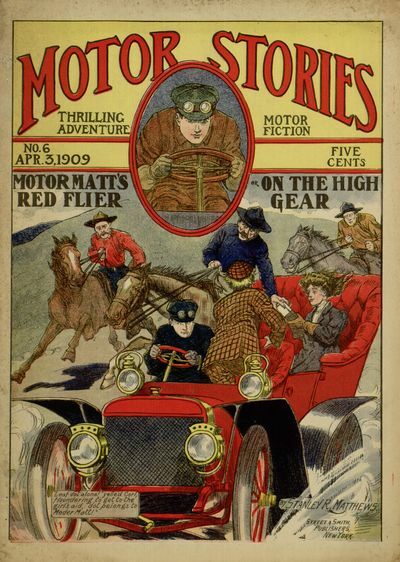 Our latest completed Distributed Proofreaders project is Motor Matt’s Red Flyer; or, On the High Gear, the sixth volume of the Motor Stories series of dime novels. This adventure picks up right where Motor Matt’s Mystery left off, and offers more of the now-familiar mix of engagingly-written action and offensively stereotypical characterizations. Of particular note in this volume is the fact that Motor Matt ends up befriending a company of actors from an Uncle Tom’s Cabin show. Given the occasionally nuanced portrayal of racial issues displayed by some of the previous adventures, one might hope for a hint of thoughtfulness here, but unfortunately, this one leans entirely in the direction of using African Americans as “comic relief.” Perhaps the best that can be said is that this book helps to demonstrate (for better or worse) the lasting cultural impact of Harriet Beecher Stowe’s novel more than half a century after its original publication. 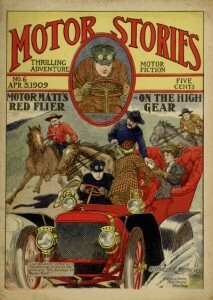 As always, the complete story can be read online at Project Gutenberg, where downloads in popular eBook formats are also available.